FORT WORTH, Texas — Raphael Cruz, the father of Republican presidential candidate Ted Cruz, recently spoke at a minister’s conference hosted by Texas prosperity preacher Kenneth Copeland, during which time Copeland declared Cruz to be “called and anointed” for the presidency. Cruz appeared at the Jan. 19 KCM Minister’s Conference in Fort Worth, where he spoke about the biblical standards for voting and the need to reclaim America for Christ. “If the wicked are in authority, they are going to legislate their wicked brand of morality,” he proclaimed. At the end of his teaching, Copeland asked Cruz to outline how the family spent time in prayer before his son announced his candidacy for office. Cruz said that his son had spent six months praying, and recalled the day that the family gathered in his pastor’s office praying for two hours. 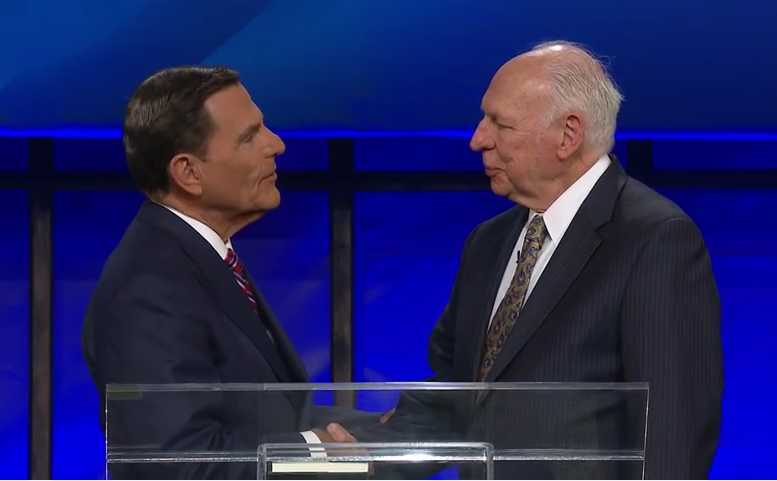 Copeland and other word of faith preachers, such as Jerry Saville and Keith Moore, laid hands on Cruz and prayed for strength and boldness for the preacher. Copeland’s son-in-law George Pearsons then prayed that prophesies of a “new birth” of the nation would come to pass, where prayer would return to schools and abortion abolished. As previously reported, around the same time that Copeland asserted that Cruz was “called and anointed” by God to be president, a group of 50 African American pastors gathered in Philadelphia to lay hands on Democratic presidential candidate Hillary Clinton to “decree and declare the favor of the Lord” on her for the presidency. “God has given this man an anointing for the mantle of government in the United States and he will prosper,” Wallnau asserted. Copeland was also among those present in October when over 30 members of the clergy met with Trump at his New York City tower and laid hands on him to pray for his potential presidency.